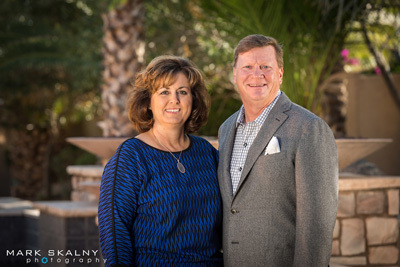 (August 2018) — Tom and Julia Marreel’s leadership gift of $250,000 to the Dignity Rising campaign of the Dignity Health Foundation East Valley continues their legacy of giving. This generous pledge will help bring highly-specialized care to the community. Specifically, their gift will enhance the services of pediatrics, cardiovascular, neurosurgery, thoracic surgery, maternal child health, neonatology, and level I trauma. They continue over 15 years of leading the way in the philanthropic community through their generosity and leadership to the Dignity Health mission. As a couple, and through Tom’s business affiliates, their cumulative giving will top $1 million with this pledge. Donations they have secured from other businesses and friends and family, would bring the total amount raised by the family to approaching $3 million. Tom is currently leading efforts to secure high level corporate partnerships on the new campaign, as well as specific lead gifts. With his experience in the insurance arena over the past three decades and his experience as chair of the foundations previous campaign, Building for Tomorrow, Tom brings all of the experience and expertise needed to secure philanthropic investments from these constituents. He has served on both the foundation board and the community board for the medical centers. Julia is also very active in foundation initiatives, having recently taken on a leadership role within the Women’s Philanthropic Society and recently joining the foundation board. Julia is also leading a strategic partnership with hospital executives and key physicians, which will focus on women’s health. 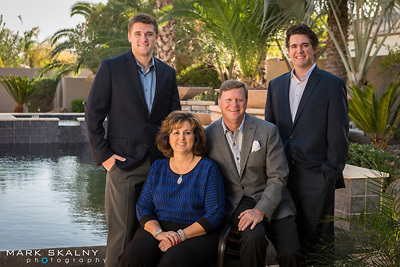 The couple continues a legacy of giving that began in the 1980s when Julia’s father, Dr. Colin Smart, was the Chief Medical Officer at Chandler Regional Medical Center. Julia grew up volunteering with her parents. Julia and her mother, Celia, have given thousands of hours of their time to hospital fundraising events. The Marreel sons have also grown up continuing the family legacy of volunteering and donating. Celia fondly remembers their family helping hospital staff plan the grand opening of the new Chandler Regional Medical Center in the 1980s. Julia and Tom were present at the opening of Mercy Gilbert Medical Center, which was built to be a physical place of beauty and healing, including magnificent artwork and gardens. The Marreel Family donated the funds to place a statue of Catherine McAuley, the founder of the Sisters of Mercy, in a water feature at the front of the circular drive of the hospital. The statue, created by Michael Meyers of Prescott, Ariz. is to honor the healing ministry that takes place at both Mercy Gilbert Medical Center and Chandler Regional Medical Center. This is a fitting tribute from a family who has dedicated their philanthropic efforts to Dignity Health’s mission.